If you would like to walk around the trail, just follow the arrows on the signposts, which will take you past kettle holes marked by numbered erratic blocks (boulders). Leaflets with a map and further details can be found in the box at the side of the information board at Grandls Hofcafé or in the café itself. 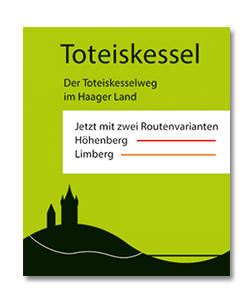 After about half an hour, you will find that the trail divides into two, with one route going to Höhenberg and the other to Limberg. In both cases you will need about 2 – 2.5 hours for the complete walk. Sturdy shoes are recommended. Kettle holes are depressions in the ground that form when blocks of ice separate from a retreating glacier and become buried in outwash. When they melt, they leave behind hollows that eventually fill with water, sediment or vegetation. The kettle holes on the trail were formed some 18,000 to 12,000 years ago, during the final stage of the last ice age. Why are kettle holes special? Kettle holes only occur in glacial landscapes, meaning they are fairly rare. Yet over the past century many have been filled in or levelled off for farming, with the result that fewer and fewer are left. Kettle holes come in many shapes and sizes and vary in vegetation and microclimatic conditions. As a result, they frequently offer a refuge for plant and animal species unable to survive in intensively farmed landscapes. The organisers of the Kettle Hole Trail and the landowners hope you enjoy discovering the kettle holes along the trail, but cannot accept liability for accidents. The Kettle Hole Trail is the work of two local groups – a local chapter of Bund Naturschutz, a Bavarian nature conservation association, and Agenda 21-Haager Land, an Agenda 21 group of volunteers who got together in 1999 to implement ways of sustaining the economy and the environment in the Haag district. Fifty percent of the funding for the original Kettle Hole Trail came from the European Union as part of the EU Community’s Leader+ initiative for rural development, and much support has been provided by local experts, farmers, businesses, politicians and volunteers. It is thanks to a generous endowment from the Gerhard und Ellen Zeidler Stiftung, a local foundation, that it has been possible in 2013 to include further kettle holes in the trail.